Recently the Ubuntu Michigan Loco got together as a community both at Ohio Linuxfest and at our recent release party for Ubuntu 12.10. 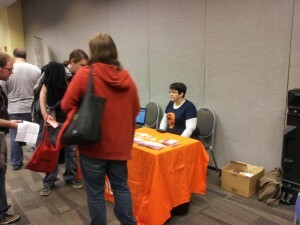 At Ohio Linuxfest we partnered with the Ubuntu Ohio Loco to staff a booth for the show. It was an amazing time, especially since we were also sharing convention space with Wizard World Comic Con which was adjacent to Ohio Linuxfest. We had a lot of crosstalk between our different conventions, and many folks either were already using Ubuntu, or were looking to learn more. We handed out lots of discs, and plenty of business cards to folks who weren't already part of the Ubuntu Loco community. As luck would have it, I was also interviewed by the new Distrowatch Video Podcast to talk about Ubuntu, the community, and what's happening with Ubuntu. I had a lot of fun, and I'm hopeful those business cards and discs got more folks involved with our merry little band of Ubuntu-folk. Big thanks to the Ubuntu Ohio Loco for putting together the table reservation, and for letting us tag along. One constant question at Ohio Linuxfest was "is this the new release", pointing to the discs we had on-hand. Of course Thursday witnessed the release of Ubuntu 12.10 (on schedule, huzzah), and our merry band of Ubuntu Michiganders convened at the Royal Oak Brewery this past Saturday. Unfortunately our timing was again impeccable, as this was also the same weekend as the "big game" between University of Michigan and Michigan State. The Brewery was pretty packed, but thankfully they accommodated us well, and we're truly grateful for their hospitality. It was also one of the few times I've heard someone play bagpipes in close vicinity, as one of the folks in The Brewery would play U of M's fight song "Hail to the Victors" whenever they scored. Needless to say it was a release party I won't soon forget. 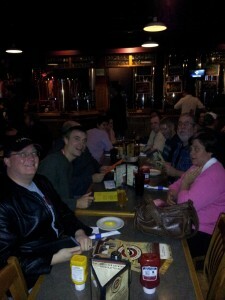 We also had a lot of regulars, and some new folks come on out to celebrate and talk about the new release of Ubuntu. All in all a fun time was had by all, and we finally got a chance to see Jorge after his hiatus down in Florida. We're thrilled he's back, and are looking forward to helping make Ubuntu 13.04 another awesome release. Thanks to everyone for their help and support! You all rock!